Ethan is is 6-month old! He is on solid now! Last 2 weeks, we tried him with apple. First spoonful.... frown, confused face & lots of mouth moving. He doesn't seem to enjoy it! So I stop feeding him. Then later in the afternoon, we tried him with Nestle Brown Rice Cereal. Hey, he loves the cereal. We feed him 2 meals a day & the amount is increasing from 2 teaspoons to 6 teaspoons now. Hubby & I actually think that Susana has fed him too much because his tummy is getting bigger! 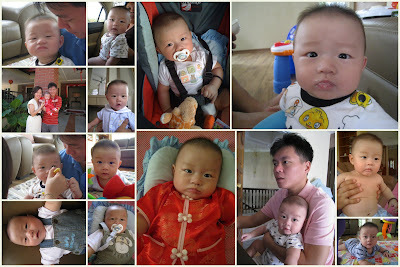 Last 2 days, he experienced some bloating & gassiness. Haha! My poor little boy! BB has asked me to tell Susana to cut Ethan's cereal feeding to one meal . Last night, BB opened up the cereal and realized that they have almost finished up the tin of cereal in 1 week. He was so furious and told me to convey his message to Susana! Oops! Besides, Dr. Gan has also reminded us not to introduce Ethan with too many food at a time. In case he has allergic reaction, then we are able to discover the food he is allergy to. Some might say we are skeptical and "kiasi" to expose our baby to difference type of food, but who care! We rather play safe than facing unnecessary consequences later! Besides, we also unsatisfied with Susana's style of feeding. She will feed Ethan on lying down position. Frankly speaking, when Ethan was as young as 2 months old, they already fed him milk on this position. I dislike it because I worried he will be choked! Somehow, I have no choice but to accept it. Again, they are doing it when he is on solid! I totally can't accept it this time. So, I can only keep on reminding Susana to stop feeding Ethan in such position. Hope Daddy will buy him a high chair soon! Basically, Ethan is fun, active and playful. He loves to play & he is not shy to laugh out loud! When he is unhappy, he cried out loud. Hmm... Guess that is the best part of being a baby! Kiss Kiss!